When IDEA opens pom.xml it's similar to running "mvn idea:idea". 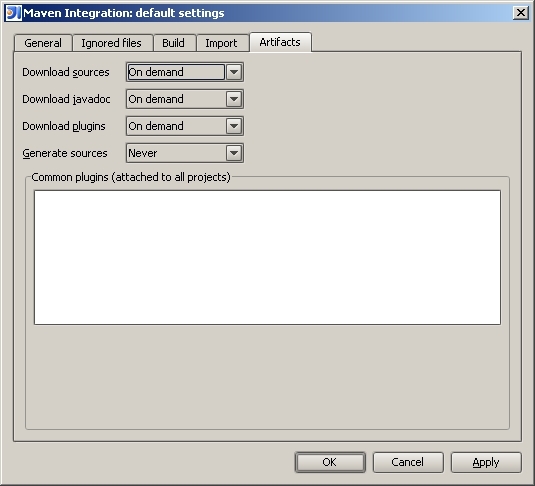 But this plugin had an option to also download sources and javadoc archives. Today when IDEA reads pom.xml and configures project dependencies - it ignores completely the issues with sources/javadocs. What I think would be very useful is before reading pom IDEA would ask user whether to download sources/javadocs of project artifacts and if yes - they will be downloaded and project's dependencies configured properly (for every artifact - it's sources/javadocs set). The "Fixed in build" states 8,032 (which sounds like IDEA 8.0), but the "Fix Version/s" field shows "Selena Bugfix Update". So hopefully that means 7.0.2. Can someone at JetBrains confirm that? isn't the option on the maven panel doing what you want ? that means 7.0.2. Can someone at JetBrains confirm that?